If you ask a dentist or a dental hygienist, they’ll tell you that their patients don’t always know how to floss. They know they should- at least once a day; but for some reason, they either don’t floss or don’t floss properly. It’s an important step to your dental hygiene, and crucial to keeping your teeth and gums healthy. Think about how you floss your teeth. Are you using enough of it? What about the direction you sweep the strand across your teeth? If you don’t floss the right way, you run the risk of causing problems for your teeth instead of preventing them. So think about the way you floss. Can it be improved? Length matters: Use about 18 inches of floss, wrapped around your index fingers. This makes it secure and gives you room to move around your mouth. Clean both sides: The space between teeth has two sides to clean. Once you clean one side, move to the other. 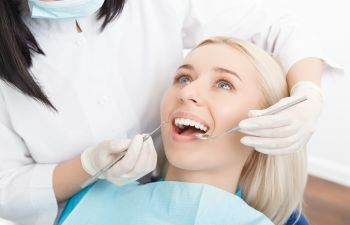 Rub the right way: Start at the gum line and sweep the floss over the tooth and just under the gumlines, up and down, keeping it taut against the tooth the entire time. Be gentle: The spaces between your teeth can be very tight. Ease the floss between the teeth carefully. Raise the floss over the gums between your teeth before moving on to the next one, don’t slide it straight over. Try a pre-loaded flosser. You can slide it between your teeth just as easy, and may have more success reaching areas toward the back of your mouth. Don’t forget behind your last molars! This area needs to be cleaned, too! Dr. Leppo and Dr. Trost can help you learn better techniques for flossing. When you come for your next cleaning ask us to guide you through your hygiene routine!